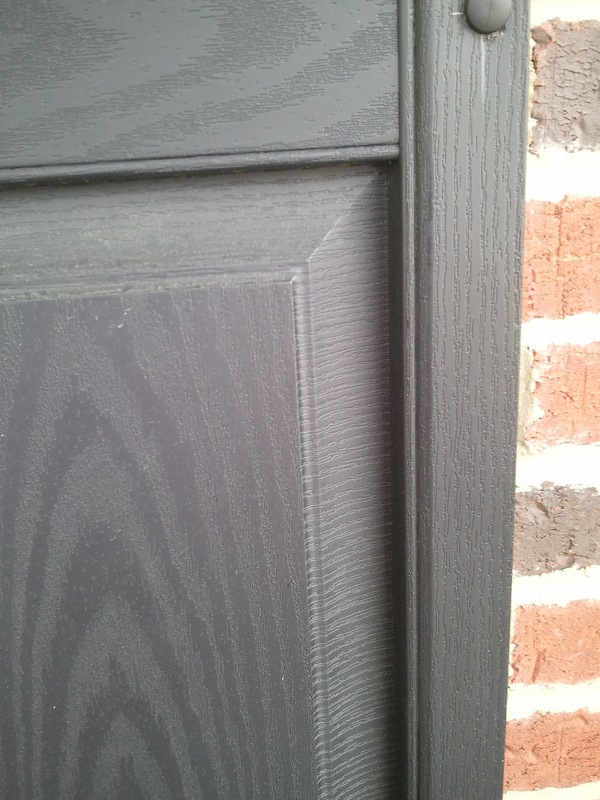 One other small item concerning the shutters… I noticed the orientation of the faux cathedral pattern on the panel. I was told by a long-time carpenter back in the 1980s that in exterior applications you always want the cathedral pointing down. This orients the end grain breaking the surface downward and aids in the shedding of moisture when the finish begins to weather. This, of course, is the opposite of way that a furniture maker would view the orientation. To support this theory, I’ve seen several exterior oak and cypress panels in the wild oriented “upside down,” like the faux panel, and the cathedrals were delaminating fish-scale like. That very interesting. I spent a number of years growing up and working in the area of housing in the Mid-west and I had not heard of that. Do you know if that technique is limited to a regional use, as in the South or West? Or found throughout the country. You know you have ruined me for travel. I will not be able to drive through new areas without looking for shutters with the cathedrals pointing down. Thanks for the comment. Happy to have transferred one of my albatrosses – I can’t help but look for this every time I see vertically installed wood outside (signs, siding, etc.). I have no idea about regionality. I live in Dallas, TX and the information exchange was specifically about board and batten siding. In my mind, I’ve just generalized it to all vertically installed boards exposed to weather. This (theory? knowledge?) caused me extra work several years back when I milled up some replacement T&G / center-groove siding for my house. As you would expect, the old siding was about half one way and half the other. I did have a couple of fish-scale delaminations on the upward facing cathedrals and none on the downward, but that sample size was too small to draw conclusions. To be truthful, I have never seen any real consistency in installation, except for some old painted board signs in Dallas and an old tobacco barn in TN where there seemed to be an attempt to keep everything pointing down. I would really like to know if anyone else has heard of this “rule” before. 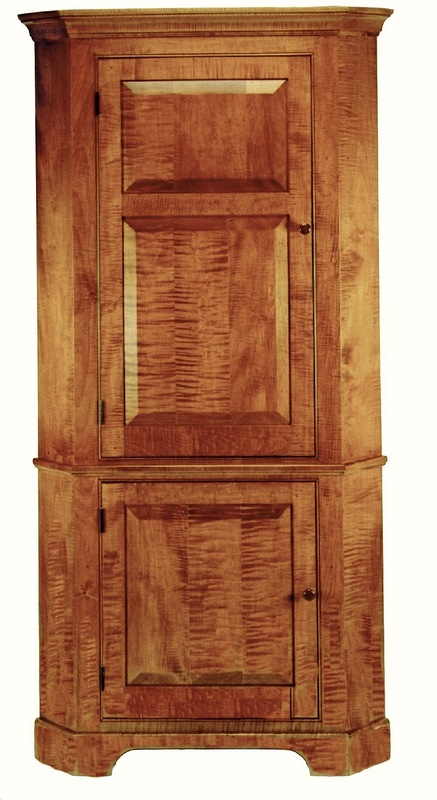 In regard to the top panel in the cupboard that you were copying from , I would think the reason for the change in the grain orientation is because the “shape/size” of the panel. It is shorter than the other panels so the builder set the grain direction in the longer measurement which would be the width. as opposed to the other panel, the longer direction is the height of the panel. So looking at it as three separate “panels” they are actually all the same orientation.. the top section is just rotated 90 degrees. It is time to go back to school! Grain needs to be read like a topographic map, do the lines indicate hills or valleys, uphill or down? Cathedral doesn’t show up in boards with straight grain when looking from the edge, it only shows up in boards where the grain is at a diagonal to the face of the board. If you look at the edge of a board with cathedral grain in the face you will see that the water could just as easily run into the board as out depending on the face put to the weather. This is how you can read grain when planing. if you plane a board with cathedral grain starting from the same end one side will tear out and the other won’t because of the grain direction. Don’t believe everything on the internet or what old guys tell you. rapidly becoming an old guy dispensing information on the internet. I hope this saves you some time in looking at shutters on your drives.